Stephanie Harker is taking her five-year-old son Jimmy to America on holiday, but as she follows the boy through security she sees a man taking his hand and walking away with him. Shouting desperately to the security guards for help, Stephanie is violently apprehended and hit with a taser gun as they misinterpret her actions as those of a madwoman or worse. By the time she can speak, it is too late - there is no sign of Jimmy. The first pages of this book are very tense, as Stephanie tries to persuade the suspicious and sceptical guards that she is not insane or a terrorist, and that the boy has been kidnapped. Eventually she convinces them that she's genuine and the FBI is called in to take evidence from her so they can issue an amber alert. For most of the rest of the book, Stephanie tells her back-story to the FBI agent in a great amount of detail. The cost of this device is a diffusion of the suspense that has been built up to now. But the story she tells gradually grips the reader, as it turns out that Stephanie is not Jimmy's biological mother. She is, in fact, a "ghost", a professional hired to write autobiographies for celebrities. Her story begins when she takes an assignment to write a "testament to my unborn baby" for reality TV star Scarlett Higgins, loosely based on Jade Goody. We gradually learn how Stephanie and Scarlett's relationship evolves as triumphs, tragedies and, yes, pure soap overwhelms their lives in a hacienda in Essex. 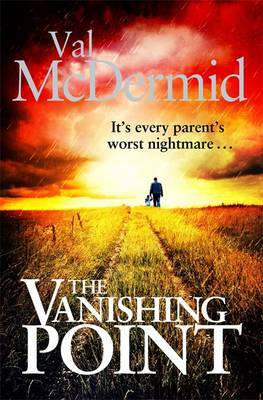 Val McDermid is second to none in her ability to write compulsive page-turners, and THE VANISHING POINT is no exception. Both in the story of the abduction of Jimmy and in the story of Scarlett's life, she constantly misdirects and outwits the reader in a book full of unpredictable twists and turns. Stephanie is an admirable protagonist with whom it is easy for the reader to identify. Although the novel is a standalone, the author reprises a CID officer, a minor character from TRICK OF THE DARK, who helps Stephanie through her many ups and downs, and there is a brief consultation with psychologist Charlie Flint from the same book; it certainly is not necessary to have read the earlier novel to get the most out of this one, however. All in all, THE VANISHING POINT is an excellent mixture of media-inspired, over-the-top drama and intense suspense as the hunt for Jimmy seems to be doomed to fail. A great holiday read.